Best-of lists are by their nature subjective things, and even more so when it comes to DVD/Blu-ray. What makes a DVD release the “best”? The movie itself? The video and audio quality of the mastering and presentation? The supplements? Rarity of the title? Scope of the collection? Critical acclaim? Cult demand? Some inexplicable balance of some or all of these? Well, I guess the latter is the closest we’ll come to quantifying the mysterious process, which is why rather than the usual Top Ten list, I’ve broken my picks into categories, so I can celebrate a box set achievement separately from a brilliant home video debut separately from a landmark restoration. Which is not to say this list is not run through with my own subjective judgments, simply that I have found my own way to spread the love around (including naming runners-up as my whims take me). I reviewed most (though not all) of these on various websites (including Parallax View) and have linked to these longer pieces wherever possible. And one last note: The picks are limited to American home video releases, simply because that’s my bailiwick and I haven’t the time or resources to explore the wealth of foreign releases that come out every year. Josef von Sternberg is the great stylist of the thirties, a Hollywood maverick with a taste for visual exoticism and baroque flourishes (which prompted David Thomson to dub him “the first poet of underground cinema”), but step back into his silent work and you’ll find a storyteller of unparalleled talent and one of the great directors of silent cinema. The three films in Criterion’s magnificent box set Three Silent Classics by Josef Von Sternberg may be all the evidence we have of this era but they are more than enough to show his mastery of the medium and the rapid evolution of his style, both a visual sculptor and as a cinematic storyteller. Underworld (1927), his third feature, has been called both the original gangster film and the proto-film noir but Sternberg turns it into a nocturnal fantasy of the urban criminal underworld and a tale of loyalty and love in a violent world. In classic Sternberg style, the grand melodrama of love, war and Hollywood The Last Command (1928) appears to be created in the studio, exteriors and interiors alike. The Docks of New York (1928), the simplest, most delicately visualized and most perfect film of the set, is the turn-of-the-century bowery answer to Sunrise, with a romantic idealism fighting its way out of hard-scrabble lives and resigned characters of the waterfront culture. In a year of superb DVD and Blu-ray editions, this is the most revelatory release. The films are beautifully mastered with two scores apiece, a pair of visual essays and an archival interview with von Sternberg. Read more at Parallax View here. This is what Blu-ray was made for: presenting a cinema masterwork with the clarity, richness and integrity of a perfect 35mm presentation. 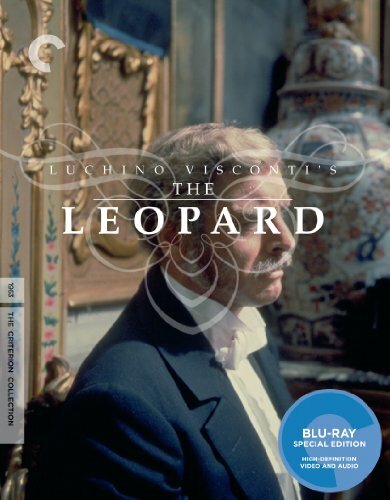 Luchino Visconti’s The Leopard (1963), freshly mastered from a stunning print with unparalleled color and crispness, is as perfect a home video incarnation as anyone could hope for and better than any theatrical screening I’ve have the pleasure to experience. On Blu-ray, the human detail is all the more apparent as we can make out everything from the details of dress to the faces and gestures of almost everyone in a given scene, and the physical details of his world are shown with crystal clarity, from the tiles of roofs in the town down the hill from the Prince’s palace to the designs of the wallpaper, the etchings on the goldleaf and the metalwork of the candelabras of the palace where the ball of the final act takes place. Apart from the sheer beauty of the film, this clarity draws us deeper into the frame and the dramatic detail, even if Visconti’s aloof camera remains a distant observer of the world. Read more at Parallax View here. The king of the jungle of giant creature features looks better than ever in this amazing Blu-ray presentation. If the acting and the dialogue verges on kitsch, the production is still awe-inspiring and the special effects of Willis O’Brien, groundbreaking in their day, are beautifully crafted and presented in all their glory in this lovingly-mastered edition. Ostensibly a drama about prescription drug misuse and abuse and drawn from an article in The New Yorker, this portrait of a grade-school teacher and middle class father (played by James Mason, who also produced and helped develop the project) is as much about adult male masculinity and responsibility as a husband and father, and the pressure on him to live up to the ideal, as Rebel Without a Cause is about the emotional realities of being an American teenager. This incisive portrait of economic pressures and social anxiety was made in 1956 but, apart from the fashions and the dialogue, it’s as contemporary as can be. Never released on VHS, rarely seen on TV or cable (and even then only in pan-and-scan versions) or revived in the dwindling repertory circuit, this film has not received its due as a masterpiece of American social drama in large part because it’s been so damnably difficult to see. Criterion’s much-appreciated release now resolves that part of the problem with an edition that celebrates the film with due respect. Read more at Parallax View here. One of the most beloved and cherished Hollywood adventures ever made and long the top of every list of DVD requests, The African Queen debuted in a stunning master on DVD and Blu-ray in 2010. Read more at Parallax View here. Filmmaking partners Bob Rafelson, Bert Schneider and Steve Blauner—Hollywood insiders who, in the late 1960s, aspired to create independent cinema within a studio system in the midst of an identity crisis—are arguably among the defining creative forces in the volatile Hollywood culture in transition. The seven films they created between 1968 and 1972 weren’t all hits, but some of those features caught the wave of the youth market and as a whole they created a model for personal filmmaking with commercial appeal. And Nicholson could be the fourth partner in this enterprise: he produced, wrote, directed and/or starred in six of these films. This set is a tribute to his explosion as a creative artist. Most of the films in Criterion’s collection have been previously released but this box set (released on both DVD and Blu-ray) pulls them all together and adds to the supplements with new and archival interviews and featurettes and commentary tracks along with those supplements carried over from previous releases, and Criterion achieves something that has eluded many a DVD special edition: new interviews with Jack Nicholson reflecting on these formative films. Read more at Parallax View here. Martin Scorsese personally selects the 15 Elia Kazan features (from Warner Bros. and Sony as well as 20th Century Fox) for this lavish collection and contributes a personal tribute to the director with the hour-long A Letter to Elia. Five Kazan features debut on DVD here, the rest are presented in the same editions as released individually on DVD. Read more at Parallax View here. Criterion follows up the 2009 release of Chantal Akerman’s landmark Jeanne Dielman with this three-disc set collecting the balance of Akerman’s seventies filmography. Read more at seanax.com. HBO’s first original series to become a buzz show was not The Sopranos. The late-night show-biz satire The Larry Sanders Show, a scathingly funny sitcom on the channel’s late-night schedule, received fair ratings, great reviews and a rabid following in Hollywood, where it became the industry’s cult show during its six year run, from 1992 to 1998. It’s all about insecurities, egos, vanity, and other show-biz ailments and Shandling (who writes or co-writes practically every episode) is ruthless with his characters’ ambitions and fragile self-images. That caustic comedy attracted an astounding array of guest stars, all happy to send up themselves and their image in increasingly clever appearances. More than a decade since it’s final program, it feels as contemporary as ever and its influence is still felt in shows such as 30 Rock and The Office. This is kind of show that benefits from supplements and the producers of this set—working closely with creator/producer/star Garry Shandling—have filled this with commentaries, interviews with co-stars and guest stars and collaborators, and the excellent 70-minute “The Making of The Larry Sanders Show.” Read more at Parallax View here. Stephen King cites this sixties anthology series, hosted by Boris Karloff with easy dignity and a theatrical flair, as his favorite TV horror show of all time. And while the first few episodes play more like psychological dramas than tales of terror, it soon steers a course through more supernatural stories and classic horrors. Though less well known than The Twilight Zone or the The Outer Limits but it completes the triumvirate of sixties American television of the fantastic and is a minor classic of its era, as this long-awaited set finally reveals. Read more at seanax.com here. A savage satire of Thatcher-era party politics and a devastating drama of power and corruption and simple moral courage, this brilliant British mini-series is dryly funny, constantly surprisingly and thoroughly engrossing, and features such a heartbreaking turn by Michael Palin in a rare dramatic role. Though well remembered in Britain it was almost unknown in the U.S. and became one of my great discoveries of the year. Read more at seanax.com here. Frank Sinatra had hosted variety specials and even a TV series in the fifties but his 1965 Frank Sinatra: A Man and His Music ushered in a new kind of television special: the mature, confident, at times even swaggering saloon singer and balladeer in a solo showcase revisiting the songs that defined his career. It was the beginning of a great tradition and this box set collects all ten of his signature specials from 1965 to 1981 along with a pair of genuine rarities: Concert For the Americas (1982), his first pay cable project, and Sinatra In Japan: Live At The Budokhan Hall, Tokyo (1985), which was released on Japan only. He swings through them all, at times with the hokey Rat Pack smart aleck humor he loves so much but mostly just delivering standards, saloon songs and even some contemporary tunes with that inimitable Sinatra grace and gravitas. Read more at Parallax View here. 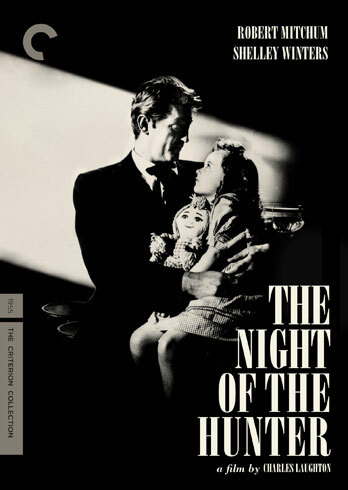 The great treasure of this release is the 159-minute documentary Charles Laughton Directs The Night of the Hunter. This unique production, created by film archivist and restoration guru Robert Gitt (who eschews a director credit in favor of: “Rushes selected and presented by Robert Gitt in collaboration with Nancy Mysel”), is composed almost entirely of outtakes and production footage from the film. Opening with Laughton delivering a dramatic reading to the camera (it appears to have been intended as an introduction to the film, or perhaps a promotional featurette), it shows Laughton stopping and restarting, quietly but authoritatively giving instructions to the cameraman and crew as he keeps the camera rolling through it all. For the rest of the production Laughton is an off-screen voice providing prompts and coaxing the actors through multiple takes of their performances, but his presence is defining. Gitt structures the sequences in narrative order rather than shooting chronology and puts the takes in context of the surrounding scenes, the better for us to place the scenes and see the shaping of the performances. In one sequence, we see inability to get the performance he wanted from one actor and follow it up with the role recast and the new actor (James Gleason) delivering the character he wanted. I’ve seen nothing like it before, and certainly nothing this exhaustive and complete, and it alone would make this disc indispensable. At one point in Abbas Kiarostami’s Close-Up, the main character says “I am the child from the film The Traveler who is left behind.” He’s referring to a 1974 film by Kiarostami, which makes its American home video debut on Criterion’s DVD. It’s classic Kiarostami—a simple story of a journey by a spirited schoolboy—in primordial form, and a true piece of cinema archeology. Read more at Parallax View here. The DVD debut of Michelangelo Antonioni’s color debut is accompanied by two early Antonioni documentary shorts: his debut film “Gente del Po” (1947), a portrait of the hard loves of the people living on the Po River, and “N.U.” (1948), about the street cleaners of Rome. Both show Antonioni’s focus on placing people within their landscapes, rural and urban. Read more at Parallax View here. 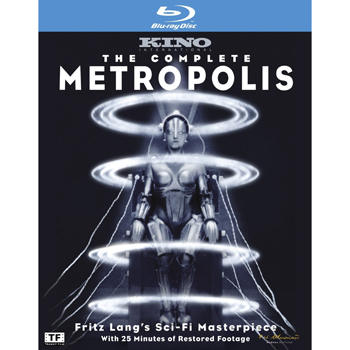 Fritz Lang’s 1927 epic is a landmark science fiction filmmaking, a masterpiece of silent film and a visionary work of cinema, and its reputation has been based on an incomplete version of his original film. With the miraculous discover of a 16mm print in Argentina, the Murnau Institute has been able to finally restore the film to its almost complete form (it is still missing a couple of minutes of footage). The footage from the Argentinean print—washed out, scratched and scuffed almost beyond repair—stands out from rest of the restoration, which comes from the best materials available and looks superb. But they also add personality to the narrative with characters and stories cut out of previous versions, and the restored rhythms of Lang’s editing make it more of a visual symphony. I respect Metropolis more than I love it, but you can’t deny the significance of the production or the importance of this restoration. Read more at Parallax View here. I can’t begin to find the words to describe this unclassifiable Japanese haunted house/high school romp/demon killer/surreal fantasy film from Nobuhiko Obayashi. Made in 1977 and recently revived and released to the rest of the world, it’s the archival cult find of the decade: a candy-colored style bomb of a horror movie, more jaw-droppingly unreal than scary, an experimental piece of pop-art genre filmmaking. Is it good? The question seems to miss the point. It’s like nothing you’ve every seen, or maybe more accurately it’s like a whole lot of wonderfully weird things you’ve seen, from young romance Technicolor melodramas to Mario Bava horrors to Looney Tunes cartoons and more, blended into a surreal puree and poured into a funhouse of cinematic delights. It’s astounding. Read more at Parallax View here. How did the reputation of actor, playwright and filmmaker Sacha Guitry, once the toast of French theater and cinema and popular culture, slip into such obscurity over the years? This box set of four key features showcases the filmmaker at his best, with intricate narratives are that endlessly inventive and writing that sparkles with comic invention, droll wit and continental sophistication. And as a leading man, he’s a model of easy elegance and knowing experience. Read more at Parallax View here. This British series of the seventies, a comic drama set in the smudged lines between opportunistic hustling and criminal schemes, is a corker of a show with the sensibility of The Rockford Files in the London urban underworld. “One of the best-ever British TV series,” reads the description on the case, and I can’t argue with that. Read more at seanax.com here. A series of cheap sets featuring haphazardly mastered versions of films produced (and in a couple of cases directed) by Roger Corman. There are some debuts of minor cult items here, but the prints are worn, menus are poorly designed and the words “Hollywood Select Video” are burned into the corner of the image of each of the noisy, poorly-mastered films. VCI put out a new edition of this underrated Allan Dwan western in 2010, adding supplements but neglecting to upgrade the weak video master. This film deserves better, and so do we. Read more at seanax.com. The transfer is just fine, it’s the film itself I find problematic: a cult film with a reputation based on a demented concept but no intelligence or art to the execution. Read more at seanax.com. I just got my own copy of von Sternberg set and indeed it is a total stunner! The extras truly are extras and I’ve been waiting years for underworld and docks of new york to come out on DVD (the old VHS of ‘docks was pretty good but the Underworld copy I’d seen was a Grapevine special. This set totally made my year.